A security guard with his firearm drawn. Los Angeles - A security guard at a Jewish high school for girls in Los Angeles shot a man in the leg after he “became belligerent,” and the school went on lockdown. Students are not in any danger, according to the school. 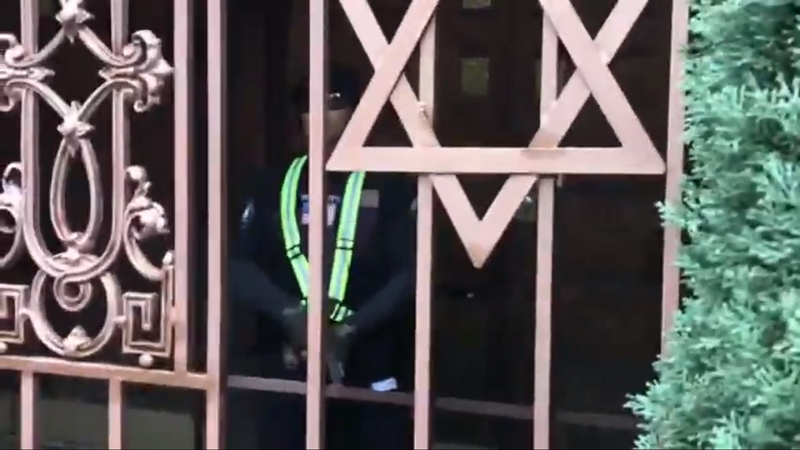 At around 1 p.m. Thursday, a man was “canvassing” around Ohel Chana High School, according to an email sent to parents. The school security guard confronted him and shot him in the leg after he “became belligerent.” The man was not critically injured, and no students were hurt or put at risk. The school was put on lockdown until police give notice that all is well. Students have been given extra time to relax before class. Ohel Chana, which is geared to Hasidim, serves 99 students in grades 9-12, according to the Private School review website. On the anniversary of a devastating school shooting, a person videos a Jewish girls school for 45 minutes, mocking their customs and way of life, taking note of every security camera, every window, every door, marking the address, intersection, and every identifying feature for some listener, and refuses to cooperate when questioned. When someone takes action to protect the kids, that person is arrested. The stalker/agitator/instigator gets a news briefing. Dear media, please say tell us again how you are against racism, please tell us again how you are against school violence, please tell us again how you are there to protect the voiceless. “ On the anniversary of a devastating school shooting, a person videos a Jewish girls school for 45 minutes, mocking their customs and way of life, taking note of every security camera, every window, every door, marking the address, intersection, and every identifying feature for some listener, and refuses to cooperate when questioned. If this "security guard" was arrested, then the police are doing their job. Watch the video. The "guy" (yes, quotation marks are appropriate) was behaving legally and was not belligerent. The "security guard" just mumbles "get away" and moments later illegally fires a "warning shot" into the sidewalk. The ricochet hits the "guy" in the leg (it also had the potential of hitting just about anyone in the vicinity). Such irresponsible behavior endangers everybody. Every Shul, Jewish school, Federation, JCC, Israel Bonds Office, and other Jewish organizations must have armed security at all times. “ If this "security guard" was arrested, then the police are doing their job. The only thing you see on the (now available) video is what the person who was taking the video wanted you to see , choosing when to live-stream and when not to live-stream, and what to live stream. And that is the same person who claims to have been shot. But there are web sites that note that there was also another video, about an hour long, from the this same person, which was shortly taken down after barely being posted on youtube, which shows what the fist poster has written. What the story doesn't say is that this was a transgender personality named Zhoie Perez. Remember the politicians we vote for want them to go in our daughters showers!